Dr. Jarnagin accepts the following list of insurance providers. Select your insurance provider to see more details. I am a surgeon with more than 20 years of experience in diagnosing and treating men and women with benign and malignant (cancerous) diseases of the liver, bile ducts, gallbladder, and pancreas. Most of my patients have primary liver cancer, pancreatic cancer, bile duct cancer, or colon cancer that has spread (metastasized) to the liver, which is known as secondary liver cancer. I also treat benign conditions such as pancreatic cysts. As Chief of Memorial Sloan Kettering’s Hepatopancreatobiliary Service, I oversee a team of seven board-certified surgeons that performs as many as 1,000 cancer-related operations every year on the liver, pancreas, gallbladder, and bile ducts. We work intimately with the broader healthcare group — medical oncologists, radiologists, and others — meeting weekly to discuss each patient’s care. In these and other ways, we design the very best treatment plan possible, customized to each individual’s needs. It was during my research fellowship at The Liver Center at the University of California, San Francisco, that I became interested in focusing on liver, biliary, and pancreatic diseases. When I returned to clinical training, my interest in caring for patients with these disorders crystallized, so I pursued a surgical fellowship with Dr. Leslie Blumgart here at MSK — and I never left. 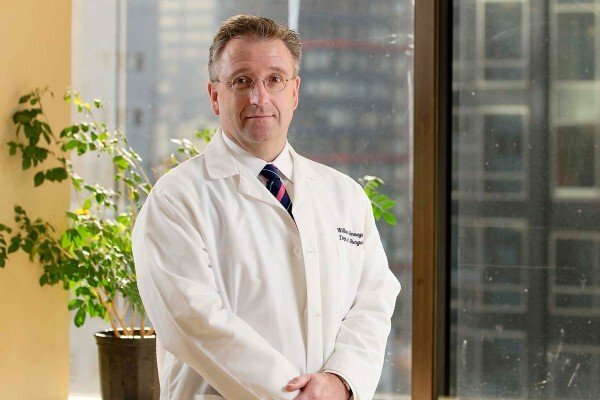 In addition to my time in the clinic and operating room, I have a keen interest in research, and have been actively involved in several clinical trials since joining the faculty at MSK in 1997. My colleagues and I are actively investigating novel therapies for patients with bile duct cancer and primary liver cancer that cannot be treated surgically. Alongside colleagues from medical oncology and radiology, we are studying how these tumors respond to treatment. We are also learning more about the most basic, molecular genetic changes that take place in bile duct cancers to understand how these tumors develop in the first place. For patients undergoing surgery, we are also trying, whenever possible, to use minimally invasive approaches (laparoscopy and robotics) and image-guidance systems to treat cancers of the liver and pancreas. Such approaches may allow for faster recovery. Outside of MSK, I am a Past President of the AHPBA (Americas Hepato-Pancreato-Biliary Association), the largest organization for liver and pancreas specialists in North and South America, and am currently Treasurer of the IHPBA (International Hepato-Pancreato-Biliary Association). Also, I am an elected member of such national organizations as the American Surgical Association, the Society of University Surgeons, and the Southern Surgical Association. Thus far in my career, I have been honored to speak around the world on a host of topics, and I have contributed to more than 200 peer-reviewed publications, and in collaboration with colleagues from MSK, have edited two medical textbooks: The American Cancer Society Clinical Oncology Atlas Series: Hepatobiliary Cancer and Blumgart’s Surgery of the Liver, Biliary Tract, and Pancreas. On a personal note, I am especially proud of my six years of service as a member of the US Naval Reserve’s Medical Corps, a commitment that took me to naval bases around the country to train with physicians, nurses, and other naval personnel. Visit PubMed for a full listing of Dr. Jarnagin’s journal articles. Pubmed is an online index of research papers and other articles from the US National Library of Medicine and the National Institutes of Health.